January 20, 2019 8:30 pm. Beauty Generation and Beat The Clock grabbed the headlines with Group 1 triumphs at Sha Tin this afternoon (Sunday, 20 January), but a fascinating undercard saw Waikuku and Ho Ho Khan lead the four-year-old advance along the road to the BMW Hong Kong Derby (2000m). Waikuku (120lb) took his Hong Kong record to two wins from three starts with a dominant win in the final contest, the Class 2 Po Yan Handicap (1400m). The two and a half-length victory built upon a smart breakthrough success three weeks prior. “That was a very impressive win,” Joao Moreira said of the John Size-trained four-year-old, the Brazilian ace having sealed a four-timer on the day. Size sent last year’s Derby winner Ping Hai Star straight into the mile and a quarter test off three 1400m handicap wins. Fellow Derby entrant Taking Aim (124lb), from the John Moore stable, filled the runner-up spot, with another four-year-old, Hinchinlove (123lb), third. 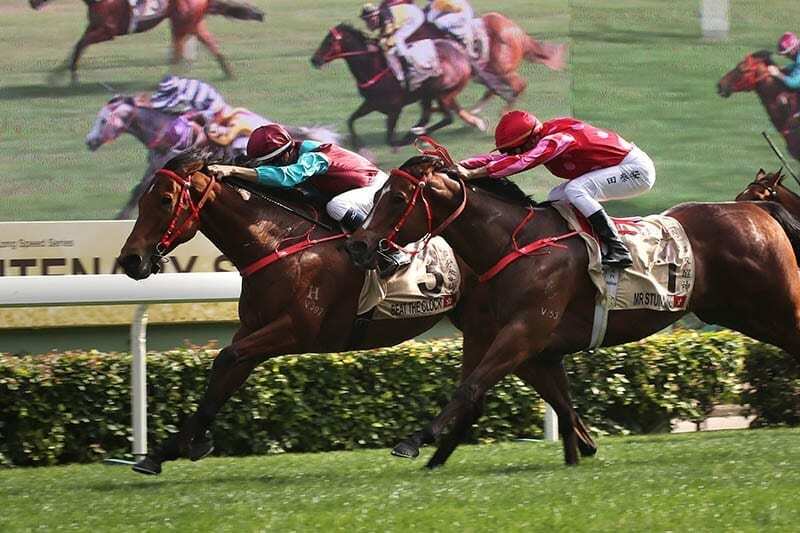 Ho Ho Khan (118lb) also took a sizeable stride towards the BMW Hong Kong Derby (2000m) on 17 March, thanks to a smart win in the Class 2 New Street Handicap (1800m). David Hall’s Australian import completed a hat-trick of wins under Vincent Ho and is likely to join the Four-Year-Old Classic Series at the second leg, the Hong Kong Classic Cup (1800m) on 17 February. Ho Ho Khan held fellow Derby candidate Helene Leadingstar (123lb) by three-quarters of a length, with the temperamental Savvy Six (124lb), ninth in last year’s Derby, a further length and a quarter behind in third. Prior to this afternoon’s success, Ho Ho Khan had raised his rating to 82 from a start-of-season 71. “It was nice to see him do what he did today to give you confidence that you’re not going there (the Derby) to make the numbers up,” Hall continued. “I think he took a little bit more of a step today, he went quite softly without being punished and the extra 200 metres, well he’ll be all over that. Another four-year-old with Derby aspirations, Nicconi Express (119lb), started the 1.7 favourite; Size’s charge finished fifth under Moreira, fading in the closing stages of his fourth Hong Kong start.